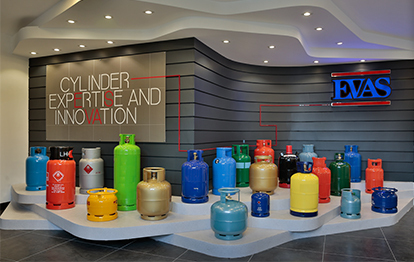 EVAS a leading global company specialized in manufacturing of steel LPG cylinders has been offering customized solutions for LPG filing & distribution companies since founded in 1963. Over the years EVAS has become a reputable and reliable brand in LPG sector for all global energy companies around the world. As being a part of SHV Energy family, EVAS always carries the consciousness of maintaining high standards in terms of manufacturing, quality and services. Global industrialization has been setting higher standards each day. Manufacturing LPG cylinder is a sensitive process where sense of quality and safety is always priority. As EVAS we believe that to maintain a successful management and sustainable organizations, sharing the knowledge and distribution of intellectual capital within company is highly important by operating in parallel with our mission, EVAS has been putting high importance on research and development of its production line as well as new product presentation that will enable us to lead in our core markets and to create future markets.